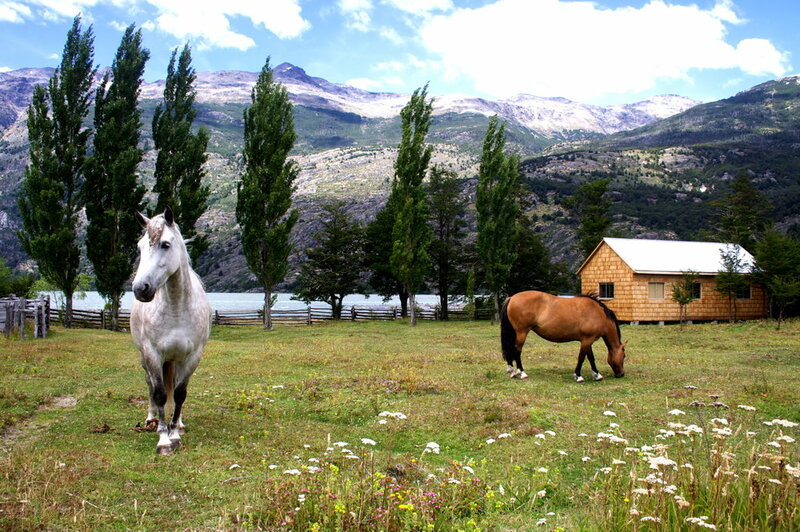 Explore an untouched and largely unknown part of wild Patagonia. The Gaucho Way is our signature route. It follows traditional routes used by the Gauchos, Chilean cowboys who are friends and neighbors. On horseback, they herd cattle to market and return to their homesteads with flour, sugar, yerba mate and other sundries. The Gaucho Way denotes both their passage through the mountain landscape and their distinctive, gracious culture. We trek through beautiful valleys, lush forests, craggy mountain trails, and sandy beaches all with the Northern Patagonia Icefield rising 10,000 feet above you. Day 2: Arrive Santiago. Domestic flight to Balmaceda Regional Airport (BBA). Private transfer to Puerto Bertrand. Overnight Pto. Bertrand at Local Guest Cabin or Bed and Breakfast. Day 3: Full day trek with two brief boat shuttles. 7 km. (4.5 mi.). Overnight Tent Camp at Cacho Ranch. Day 4: Full-day trek. 12 km. (7 mi.). Overnight at PF Guest House, Main Ranch. Day 5: Day at main ranch. Options for day hike or riding. 0-18km. (0-11 mi.). Overnight at PF Guest House, Main Ranch. Day 6: Continue multi-day supported trek. 12 km. (7 mi.) Overnight at Tent Camp at Cacho Ranch. 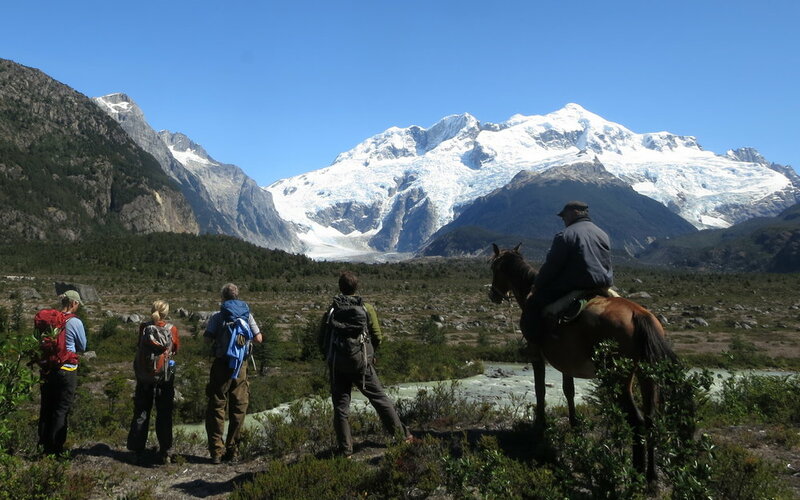 Day 7: Trek to view Northern Patagonia Icefield. 12-18 km. (7-11 mi.). Overnight Tent Camp at Glacier Camp. Day 8: Continue trek down valley. 12-18 km. (7-11 mi.) Overnight at Tent Camp at Cacho Ranch or alt. camp. Day 9: Complete supported trek. Traditional Patagonia asado (BBQ). 12-16 km. (7-10 mi.) Overnight at PF Guest House, Main Ranch. Day 10: Boat shuttle to Puerto Bertrand. Raft the Baker River. Overnight Pto. Bertrand at Local Guest Cabin or Bed and Breakfast. Day 2: Upon arrival to the Santiago airport (SCL) you transfer to a domestic flight. Your driver will meet you at the regional Balmaceda airport (BBA) where you will continue your journey. You will travel south on the Austral Highway on paved and improved gravel roads. Within 300 kilometers of driving you pass two small villages, Villa Cerro Castillo, at the foot of its impressive peak, and Puerto Río Tranquilo, a village on the shores of Lago General Carrera, Chile’s largest lake, and South America’s second largest lake. Driving time is approximately six hours. Day 3: After breakfast and final preparations for your first two days of trekking, you depart mid-morning, taking a short boat shuttle to the start of our hike. The route will follow a trail along the lakeshore and along stock trails, accompanied by our daypacks loaded only with essential items. Luggage, equipment, and food comes by horseback or boat in the care of our horse packers and staff. This allows for exploring and adventure. A short boat shuttle at the end of the hike will end of the day, depending upon the final route chosen to your tent camp for the night. Trekking distance is approximately 7 kilometers (4.3 mi). Day 4: Today holds a spectacular segment of the trek. Our route will rise up intermittently forested slopes to a high shoulder overlooking the joining of waters between Lago Bertrand and Lago Plomo. These waters connect through a breach in the long, narrow moraine that forms a peninsula separating the two lakes. This short gap demarcates where the deep blue of Lago Bertrand abruptly changes to the jade green of Lago Plomo. After the trail’s initial ascent, you will hike along rocky outcroppings, across high alpine valleys, and through enchanted forests of moss-covered beech trees. The glaciated peaks are at your shoulder and the waters of the lake are below your feet. Keep an eye skyward in search of an Andean condor, with its distinctively broad wingspan. Near the lake’s end are spectacular views far up the Solér Valley, where the afternoon sun stands watch over the enormous expanse of the Patagonia Icefield summits. Finish the day with a descent past a marble outcropping, sculpted by time and the elements, and walk across a forested pasture to the dock, boats, houses and barns of the main ranch. It will be a long, satisfying day finished with a wholesome meal, a glass of fine Chilean wine, and falling asleep in the rustic, relaxing guest house. Trekking distance is approximately 12 kilometers (7 mi.). Day 5: Spend the day exploring the ranch and surrounding property. Choose between a leisurely day exploring the old growth forest, searching for wild morel mushrooms, enjoying a horse ride or just relaxing. If you prefer more vigorous activity you may also choose to explore one of the surrounding alpine valleys. In the evening loads are prepared for panniers and packhorses that will accompany us on the next portion of our trip. Overnight in the guest house. Trekking distance is approximately 0-18 kilometers (0-11 mi.). Day 6: Begin the day with yerba mate, a bitter tea sipped from a gourd through a metal straw. 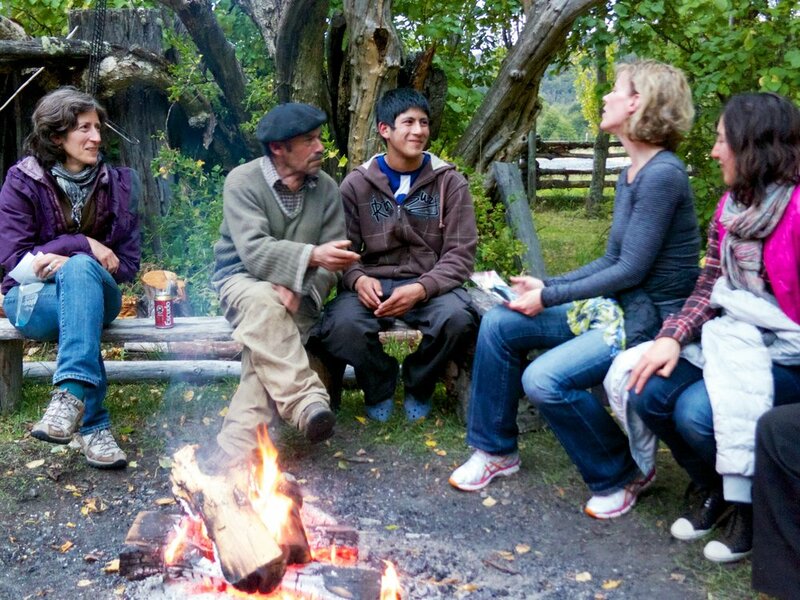 It is a traditional start to any Patagonia day and important social custom. After a hearty breakfast, the horses are saddled, the packhorses loaded with food and camping gear, and you begin your trek. You carry only essentials in your daypack as you travel along the route. There are several short creek crossings so don’t forget those sandals or water shoes. The long valleys, lush temperate forests, and mountain peaks offer a wide variety of terrain in which to hike and it’s not uncommon to see soaring condors. The varied terrain means that you’ll be able to experience everything from craggy mountain trails to long, sandy beaches, and always with a backdrop of the majestic mountain panorama. Tonight’s destination is situated on the banks of the Cacho River. This tent camp is located just beyond the intersection of two expansive valleys facing each other across the Solér Valley floor. This is one of our favorite spots and we always sense energy here, be it from the massive peaks, the open space, the flowing water, or the pristine landscape. There’s contentment here in an evening fire, enjoying good company, and watching the horses graze against a slowly darkening backdrop that reveals southern stars above white, jagged peaks. Day 7: Awake to mate and breakfast are around a campfire as you watch the morning’s sun slip down from the peak tops to the valley floor. Today you explore an untouched depth of wild Patagonia that is seldom revealed. If the day is clear, your views will encompass the surrounding peaks and glaciers, five and six thousand feet in elevation above, and the awe-inspiring and formidable Northern Patagonia Icefield, with Cerro Hyades standing firm at the head of the Cacho Valley. The difference in elevation between the valley floor at the far end of our Cacho Ranch and the summit of this colossal peak is 10,000 feet! Along the way is the old-growth forest of Coigüe, or Dombey’s beech, with its elegant branches and thick, lustrous evergreen leaves. The large Magellanic woodpecker is frequently seen or heard here, with its resoundingly deep echo reverberating through the air as it searches for grubs in the ruin of aged trunks. This is also home to the endangered huemul, or South Andean Deer, as well as predators such as Geoffroy’s Cat, Patagonian Fox, and Puma. Hidden in plain view, inconspicuous amongst the grandeur of the landscape, is a marble mountainside. Overnight at the Glacier tent camp. Trekking distance will vary and is approximately 12-18 kilometers (7-11 mi.). Day 8: The night’s long song of rumbling ice falls and murmuring tree branches gives way to the crackle of the campfire and early morning calls of the Chucao and Hued-Hued. Weather, river levels, as well as the group’s pace and energy ultimately influence our route today. If conditions permit, it is possible to reach as far as the massive glacier’s edge before continuing towards the Solér Valley. Perhaps we will have an opportunity to pass by one of our few neighbor’s homesteads, subsistence ranches deep in the wilderness, an enclave of human presence and friendly hospitality. Our tent camp location will be chosen based on conditions. Day 9: As the morning sunlight edges toward camp from across the river, you’ll sip yerba mate around the morning fire, and marvel as the light plays over the peaks of snow, ice and rock. There’s plenty of time to take in the beauty before packing up camp, and heading back home down valley. Upon departing, we will trek one of several routes back down the valley to to the main ranch. The evening will include a customary Patagonia barbecue, or asado. Guests, staff and neighbors traditionally all share in this feast of meat, slow-roasted over an open fire, new potatoes, fresh salad from the greenhouse, bread and wine. Don’t be surprised if you find yourself staying up late to listen to the strumming of a guitar and a soft, Spanish melody. Trekking distance is approximately 12-16 kilometers (7-10 mi.). Day 10: Breathe in this refreshing, cool morning air. Spend the morning on a stroll along the beach, or through the orchards, gardens and greenhouses. Take a walk in the pasture and share a moment with the horses, or relax as you prepare to say goodbye to the ranch before departing by boat to Puerto Bertrand. The dock there is the departure point for a whitewater rafting descent of the crystal-clear powerhouse that is the Baker River. Overnight in a local guest cabin, or bed and breakfast. Day 11: Depart for the Balmaceda airport, home. We hope that this sample itinerary highlights what this trip offers. 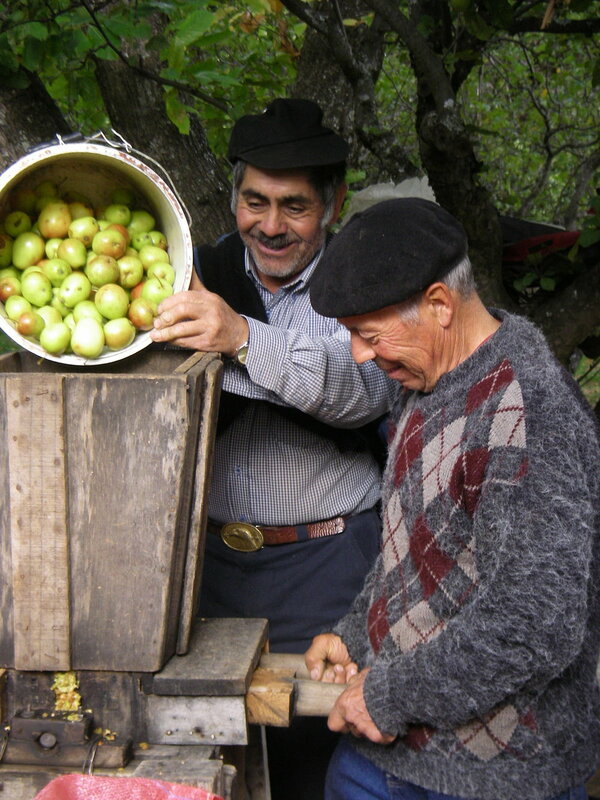 Ideally, each trip is best crafted by working together with our guests and clients. Each trip’s length, activity types, and skill level may be adapted to meet a party’s goals and desires.